Operating a TV station using electro-mechanical equipment looks really hard. That camera looking thingy at the bottom of the page is not in fact a camera, but an arc lamp. In front of the lamp is a spinning disc with holes punched in it which scans the light across the subject. The “camera” is actually composed of those six light-bulb looking things in front of the subject. They are just ordinary photo-electric cells. Avenue, New York City. The television pick-up and amplifier systems in use at this station are of the very latest design, and represent the foremost engineering thought in the realm of television. Television station W2XAB is licensed experimentally by the Federal Radio Commission, and operates in the channel from 2750 to 2850 kc, with 500 watts power. A sixty-line disc is used at the transmitter pick-up, in the studio; this means that if you wish to “look in” at Columbia’s images, as they are telecasted daily from two to three P.M., E.S.T., and from eight to eleven P.M. (Saturday and Sunday 8 to 10 P.M.), you will require a 60-hole scanning disc, revolving at 1200 revolutions a minute, giving 20 frames a second. Further, you will need two short-wave receivers, if you desire to pick up both image and voice frequencies. The images are transmitted on 107 meters, and the sound is sent out from W2XE’s shortwave transmitter on 49 meters. Chicago listeners regularly report both sight and sound reception; and many say that little or no interference is present from their local transmitters, so strong are Columbia’s television signals in that city. This being the case, it will seem that the Columbia television signals are providing very good coverage in the eastern half of the United States. In the studio where the artists appear before the photo-cells of the television pick-up, there is placed also a broadcast microphone of the latest type. While the subject speaks, a flickering pencil of light plays over his face. The source of this light is a powerful electric arc, which is housed in the metal box on the other side of the opening behind the photo cells. At the front of the lamp housing, we find an electric motor revolving a scanning disc, which contains a spiral of 60 holes. Every time this scanning disc makes one revolution, each little hole has passed a beam of light across your face; and, if the disc were rotated very slowly, you would see how each pencil of light scans a path across your face, for example. Each band or path of light exactly touches the scanning paths coming just before and after it; so that the whole area is covered. As each light-beam comes through the scanning disc hole, and moves across the face, it is reflected from the skin at some angle and finally falls upon some one of the circle of light-responsive cells. Every degree of light and shade is recorded faithfully by the photo-cells, and corresponding, though minute, electric currents are developed by the cells. As many as 40,000 to 50,000 changes per second may occur on the modern television systems, and it will thus be seen that not only do the photo-cells have to respond mighty fast, but most important of all, the vacuum tube amplifiers with their associated electrical circuits, including resistances, capacities, etc., have also to respond to such rapid changes as say 40,000 cycles per second. The specially-built television receivers of today invariably have resistance coupled, radio-frequency, amplifiers to pass all frequencies from say 50 cycles per second up to 40,000. You can “see” television images, it is true, with most any kind of a radio receiver that can be tuned to a low enough radio wavelength to pick up television signals (107 meters in this case); but, if the audio amplifier has transformers in it, instead of resistance cartridges, there will be hardly a doubt that the image you see, on your scanner, will be lacking in contrast and detail. This is caused by the fact that the average transformer does not pass frequencies much above 5,000 cycles per second; so that you would be practically “snuffing out” the difference between 5,000 and 40,000 or 35,000 cycles. In other words, you would be throwing away about 80 per cent of the detail of the picture, which has been radiated into the ether by the transmitting station, but which you failed to make the most of. The short-wave transmitter of W2XAB, used in telecasting the Columbia images, was especially designed for this purpose, and at the present time even the inductors and condensers are tuned to cover a band of 2750 to 2850 kilocycles, or it is tuned to 107 meters. The voice transmitter, operating on 49.02 meters or 6120 kilocycles, is located at Cross Bay, L. I., on an island in Jamaica Bay. The television (image) signals are radiated from the doublet antenna, supported by a pole on top of the roof of the Columbia Broadcasting building. The voice transmitter is rated at 20,000 watts though only about 1,000 watts are now being used; and on some special occasions the voice is also carried over the Columbia network, as it was on the opening night when many celebrities had their images and voices broadcast. The latest report from the program director of W2XAB is to the effect that a successful program of sight and sound covering a three-round boxing match, between Benny Leonard and Jimmie Martin, was broadcast on August 13. The referee was Jimmie De Forest, and the “mock battle” was described over the broadcasting channels by Harry vonZell and Bill Schudt, Jr., of the Columbia staff. At the rate we are going in the development of television, another year or two will probably see television carry many more such boxing bouts into thousands of homes, not to mention football games, horse races, etc. In addition to CBS, 485 MADison Ave was the home to Mad Magazine. CBS later became the only shortwave TV operation to send picture and sound on the same channel. That meant you only needed the one receiver. They got some good press for their attempts at programming, notably in the NY Times. Hobbyists wrote in from as far away as Colorado. They played with a multi lens turret, scenery slides, even news bulletins typed on a reel of ticker tape. However, most of the broadcast was limited to talking or singing heads because that’s what televised best. W2XAB went dark in 1933 after a bad financial quarter at CBS. As a programming pioneer, CBS station W2XAB stood out among several New York stations. Chicago, Los Angeles, Philadelphia, Washington, DC, Baltimore, Pittsburgh, and Boston also hosted stations. 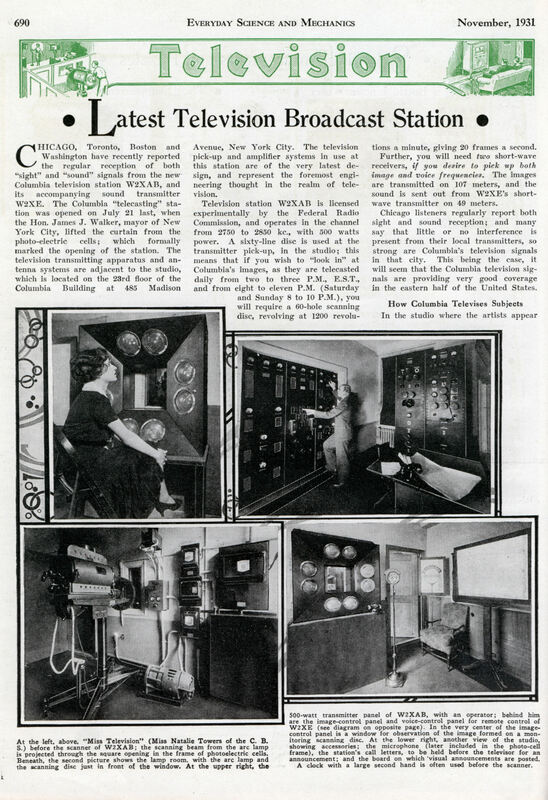 Early broadcasters built TV stations in many other cities. Some universities and technical institutes also had stations. Nighttime sky waves carried TV signals for hundreds or thousands of miles. Even areas without stations could receive pictures. Across the US, Canada and Mexico, the viewing audience numbered thousands of people. Yet few TV sets sold. The Depression prevented purchases. Fortunately kits, parts and plans were reasonable. In basements and on kitchen tables, handy folks dabbled with this thrilling, new technology. 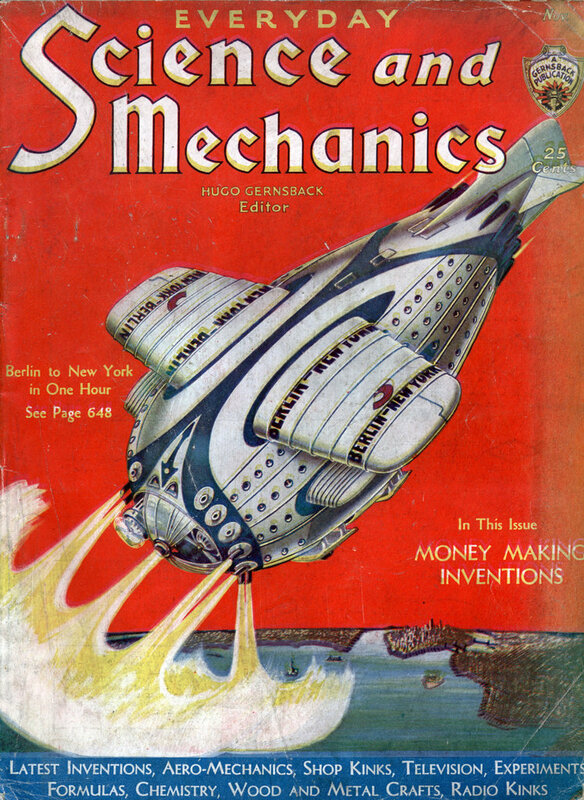 Hugo Gernsback’s science magazines provided instructions and promoted television. These magazines’ dramatic color covers portray the thrill of pulling in pictures on a homemade TV. Meanwhile, inventors demonstrated mechanical TV phone booths, widescreen theater TV, color TV, and 3-D TV. Despite these innovations, we think of mechanical TV as a dead technology. It isn’t. Graphic scanners, plasma TVs, fax machines, fiber optics and DVD players include mechanical TV technology. DLP projection sets are mechanical TVs. Inside some of these sets is a revolving color wheel. Studies of mechanical TV “ghost” reception (reflected image signals) assisted radar developers. Unlike many early stations, W2XAB left its own special legacy: TV programming and production conventions that we still find in today’s TV programming. Chicago stations W9XAP and W9XAO and Boston station W1XAV also televised regular, scheduled programming. Despite their FCC designation as “experimental,” these stations were really entertainment programmers. You might read that only English stations were true programmers. As you can see, this statement is untrue. Another untrue statement is that mechanical TV was incapable of entertaining audiences. W2XAB disproves that idea. I’ve published more about mechanical TV at www.hawestv.com. Nipkow invented the Nipkow disc in 1884.